Three Multi Task Teams have been operating in DRC since July 2016 performing various tasks including clearing areas of hazardous, unserviceable or obsolete munitions. In December 2016, one of the teams travelled to the town of Rumangabo to gather and destroy stockpiles found in the Virunga National Park, bordering the DRC, Rwanda and Uganda. They were reminded that it isn’t only humans and vehicles that are affected by the consequences of conflict. Even when the battle ends, the leftover debris affects life beyond the fighting across all spheres. When the team arrived at the ICCN (Congolese Institute for Nature Conservation) Base they were shown something unexpected: a gorilla cemetery. This was established by the ICCN rangers for the animals they protect and care for. 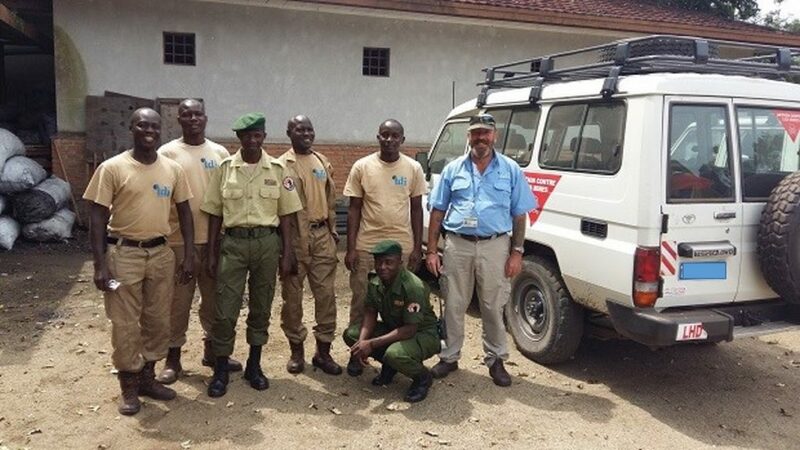 “It was clear that these men and women are hugely invested and committed to the work they do,” said Team Leader Leon Swart, “they are proud of their roles as protectors.” It is considered an honour in DRC to protect the park and the animals that inhabit it. The team took some time to look around the graveyard, “The rangers knew all the animals by name. Their graves are marked with their family line and their date of birth as well as date and circumstance of their death. Unfortunately some of the graves, in French, said ‘murdered’.” Swart said. Virunga National Park is home to more than half of the world’s remaining 880 mountain gorillas. 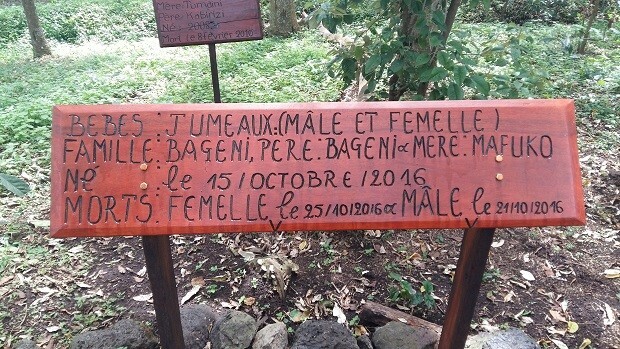 When a gorilla passes away, the Park Rangers bury them at this cemetery, located north of Goma in Nord-Kivu province. Most of them die of disease, old age, or in accidents and there are some extraordinary natural cases. For example, the team found this plaque (below). According to the ICCN rangers, a young female gave birth to twins, an uncommon occurrence for mountain gorillas, and not knowing what to do with two babies the mother fed them separately and sadly they were both weakened in the process. The male passed away six days after his birth and the baby female four days later. They were buried next to each other. Although sad, these deaths are a natural occurrence whereas, unfortunately some buried in the cemetery have been either killed inadvertently, or deliberately, by people. The rangers are passionate about their work and TDI is very glad to be able to assist in eliminating potential risks to both rangers and animals alike.